Frequently Asked Questions about IdeaWave. What is IdeaWave and crowdsourcing? IdeaWave is a crowdsourcing platform that features targeted campaigns related to areas of strategic importance to UC San Diego. IdeaWave allows the entire UC San Diego community to provide insight on current issues and to develop and prioritize potential solutions. Participants can submit their own ideas, build on the ideas of others, collaborate with others to create new suggestions, and vote on submissions they would like to see progress. I am logged into IdeaWave – where do I access the idea campaigns? From the IdeaWave homepage, click on “Explore” and choose "Campaigns" in the drop down menu. Where is my personal dashboard? From the homepage, click on “Your Page” in the top menu to access your personal dashboard. How can I get involved in a campaign if I don’t have any ideas to submit? Email or talk to your friends and colleagues to encourage them to join the conversation. To view a helpful diagram which illustrates the various ways you can contribute to the innovation process, click on “How do I contribute to the innovation initiative” from the IdeaWave homepage. Can I comment and submit ideas anonymously? By using IdeaWave, you accept that all interactions inside of the tool are transparent and you agree to comply with the UC San Diego Principles of Community and all other UC/ UC San Diego policies. Yes, voting on ideas is anonymous. How does an idea achieve Hot! status? 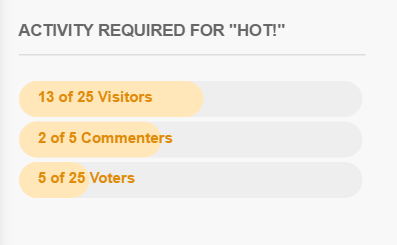 When you visit an idea page, you can view what criteria must be fulfilled in order for an idea to achieve Hot! status. The criteria for Hot! status will vary from campaign to campaign so always be sure to check what level of activity is required for that specific campaign. How do I promote an idea from inside the IdeaWave tool so it achieves Hot! status? Use keywords to tag ideas for enhanced searching. Use the “Relevant Experts” bar when filling out the idea submission form. You can tag subject experts and encourage them to discuss your idea with the community. Will I be notified if the status of my idea changes? Are all submitted ideas reviewed by the evaluation team? Campaign managers specify the criteria for evaluation when setting up the campaign and announce the requirements in the campaign description. Following the close of a campaign, the members from the evaluation team have the opportunity to identify “wildcard” ideas that did not achieve Hot! status, but may be of particular interest to evaluators. My idea was not selected for evaluation. Now what? Ideas that are not selected for evaluation by the evaluation team continue to stay active in IdeaWave. In future campaigns, idea submitters can search for previously submitted ideas that might be similar or relevant. In the event that your idea is extremely relevant to a future campaign it may be moved into a newer campaign as an active idea and selected for evaluation. Additionally you can continue submitting new ideas to IdeaBox, a place for UC San Diego faculty and staff to submit and store ideas on an ongoing basis. Ideas submitted to IdeaBox will be reviewed periodically and could potentially turn into quick win initiatives, move to a future active campaign, or serve as a catalyst for a new campaign. Still have questions? Contact us at IdeaWave@ucsd.edu or (858) 534-1093.